Would you like to receive the Toy Trucker magazine? 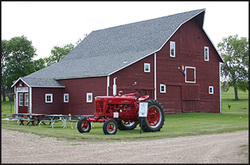 On June 18, 1999, The Toy Farmer Museum located east of LaMoure, N.D., on the Claire and Cathy Scheibe farm, held its dedication ceremony. The event was held in conjunction with the North Dakota Toy Show in LaMoure. Since the dedication and grand opening weekend, the museum has been open for viewing during the Toy Farmer Ltd. business hours at no admittance cost. A selection of gifts and souvenir items is available in the Toy Farmer Gift Shop located in the museum. The Barn originally built in 1916 for David Lloyd along Highway 13 by LaMoure, N.D. serving as a stable for championship draft horses. In 1946, Nicholas Meisch hired Henry Echre to move the barn to its present location. Matt Scheibe rough drafted how the barn could be revitalized in 1992 to store memorabilia of the Toy Farmer collection. Currently the museum houses a small gift shop and several displays. All of the Toy Farmer show tractors for the past 36 years are on display as well as many examples of proto types, first shots and special gold tractors. There are unique displays of farm toys made by many of the custom builders from both the United States and other countries. There is a complete collection of the Ertl Precision tractors. In addition to the farm displays this is a place you can bring your children, as there is a large sandbox where they can farm to their hearts content. Make plans to visit this special place when you are in the area. We welcome individuals, families, school groups, senior citizens, and bus tours. If prearranged we can provide a guided tour as well.